Although the government of Juan Manuel Santos preaches a discourse of post-conflict and pro-peace on a national and international level, in the territories, the lives and most basic human rights continue to be threatened. 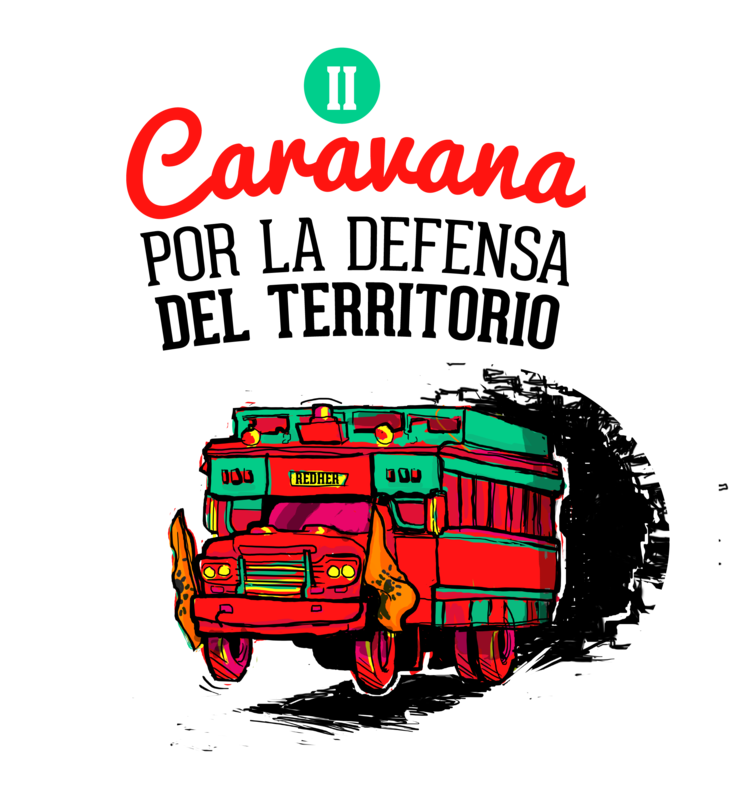 The Caravan for the Defense of Life and the Land seeks to visibilize the situation that the community, popular, and social organizations suffer on a daily basis in their attempt to create a more just country, in order to strengthen the defense of human rights. The numbers show this reality that people face. In 2014, 194 human rights defenders were attacked, and just in this year, more than 25 social activists and human rights defenders have been assassinated. The structural inequality that afflicts Colombian society continues undisturbed. The development model for the country that the Government of Santos proposes, will continue to exclude the most vulnerable sectors of the society. Despite resistance generated by the social organizations, the government incentivizes the initiatives for resource extraction and strengthens transnational entrepreneurship. The simple fact that there are 21 functioning mining and energy battalions in the army, is a testament to this government's support for this model of development. Although the peace talks in Havana have been going on for a while, the communities have seen few concrete changes. The army has yet to declare a cease to their hostilities in conflict zones. In the cities, paramilitary groups continue to threaten human rights defenders and organizations. It is urgent to visibilize this situation with denunciations on a national and international level. By respecting the autonomy of the territories and the basic rights of the people, there will be a more just, equal, and inclusive Colombia. Why a caravan for the defense of life and the territory? Caravans have been used as a tool to visibilize the problems of the Colombian people and their organizations on a national and international level. They have helped bring protection to vulnerable people and organizations, denounced the situations faced by Colombians, and supported the local struggles. In the 2015 version, the Caravan of the organizations of La Red de Hermandad y Solidaridad con Colombia decided to change the format in order to visibilize a variety of issues such as rural, urban, mining and energy, environment, and carceral. From August 15 to August 27 we will be travelling more than 1000 kms in the Colombian territory, leaving from Bogotá and arriving in Valledupar, in the north of the country. In this caravan we will aim to make visible the variety of issues faced by different sectors of Colombia's population and social movements. At the same time denouncing the environmentally unsustainable and repressive economic model. We will seek meet and learn from the communities in resistance in the regions, giving space to strengthen the proposals of local work.